A few weeks ago I shared a simple way to add texture and dimension video over on WPlus9 blog. In case you are not a subscriber of theirs, I’m sharing this video and project on my blog as well. 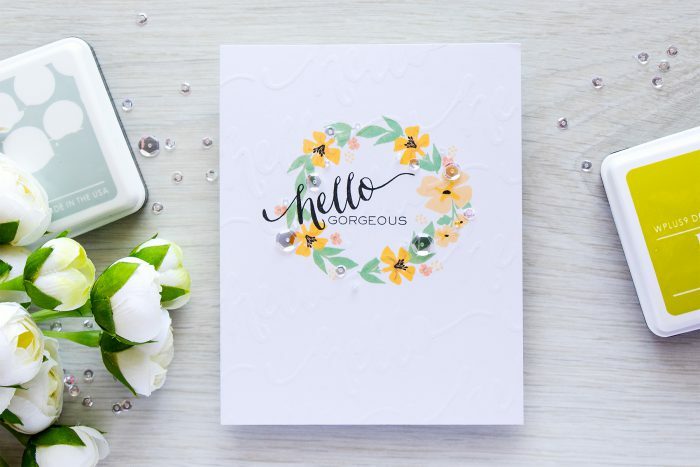 I rarely make one layer cards (even though I adore these kinds of projects) as I always feel the need to add something else, add one more layer, use dimensional adhesive and so on. 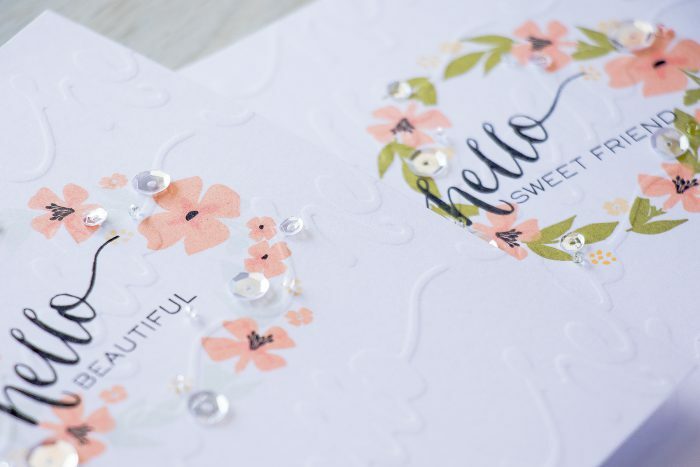 By using the technique I’m sharing here I can add a bit of something extra to a card and still keep it a one layer project. It is rather hard to see, but if you look closely you can spot a bit of additional texture on each of these cards (I made 4 in total just because I wanted to play with different ink colors and also so that I could have a few cards like this on hand). 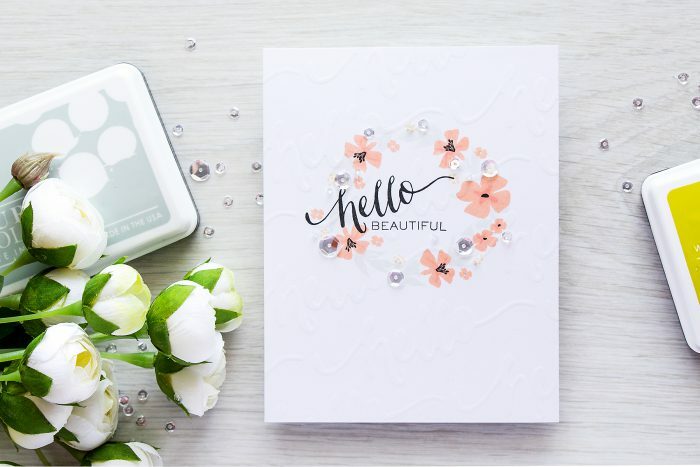 What’s even more fun – texture matches to the stamped sentiment. I started working on these projects by stamping wreath from the Fresh Cut Wreath stamp set from WPlus9 onto panels of white cardstock. 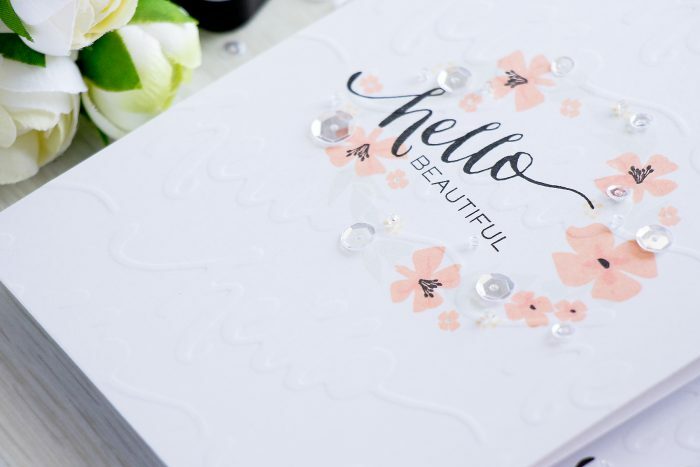 I used my mini MISTI stamp positioner and double stamped each layer, you don’t have to do this, its more of a habit for me these days. 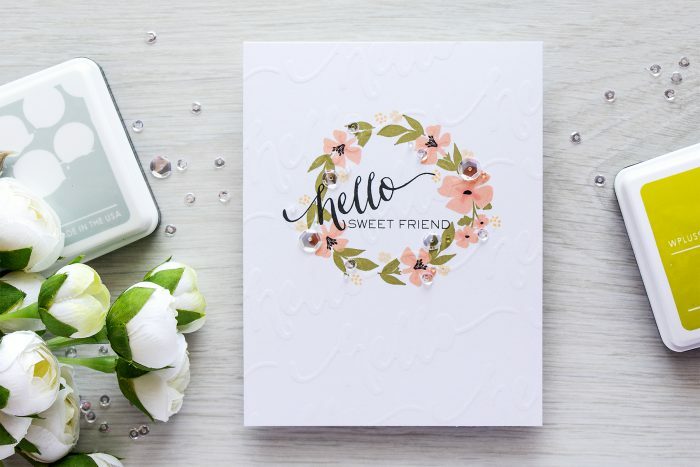 Once all of my stamping was done I created a DIY embossing folder or plate by using thick cardstock and a word die, any die can be used for this. I die cut the word die repeatedly and created a pattern. Next I embossed my stamped cardstock with the help of the DIY embossing plate in my Platinum die cutting machine. 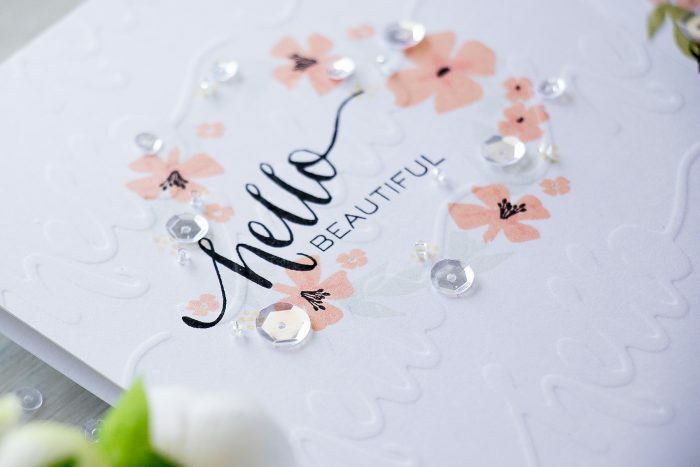 To emboss with a DIY plate like this you will need to use embossing sandwich to emboss with dies (check the instructions manual for your die cutting machine) and a Tan Embossing Mat from Spellbinders. All Spellbinders machines come with this mat, but if you are using a different machine, I am not sure if it is included with the plates, so you’ll need to check that. Here are a few more photos of the other cards I made using other colors of ink. everything else is identical on these cards. Such beautiful cards! 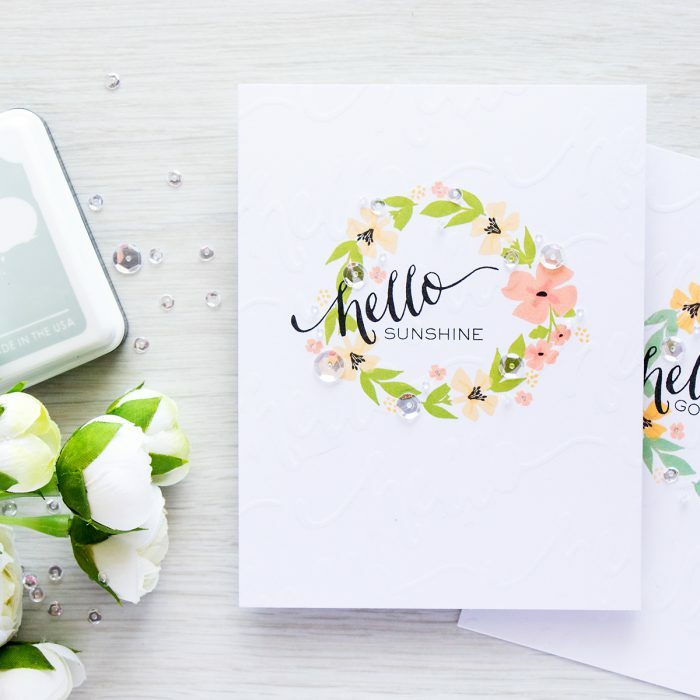 Thank you for showing how to emboss this way! I really enjoy how innovative you are when it comes to stretching your supplies. This technique is so interesting and cool. It is time consuming but definitely worth it! 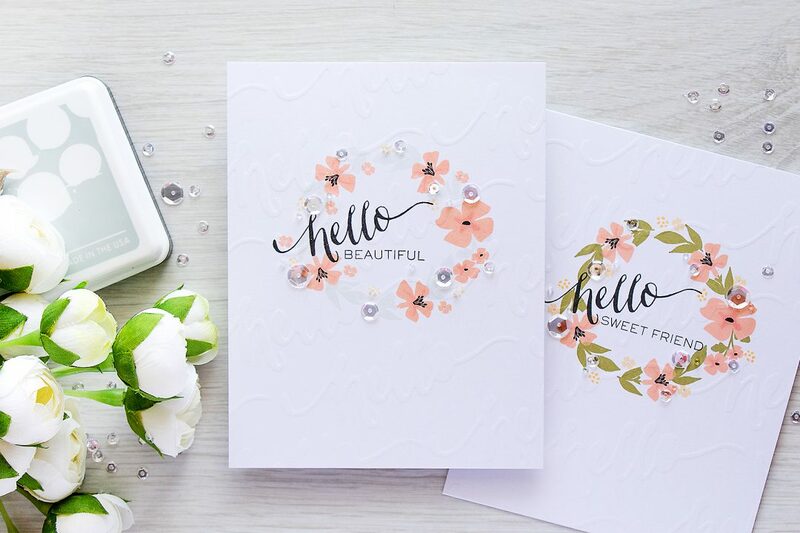 Such beautiful cards ans such a fantastic technique! Love this technique. Thanks so much for sharing. You always do amazing work.